How to add a service to Hive. On the Service Manager page, click the Add icon ( ) next to Hive. 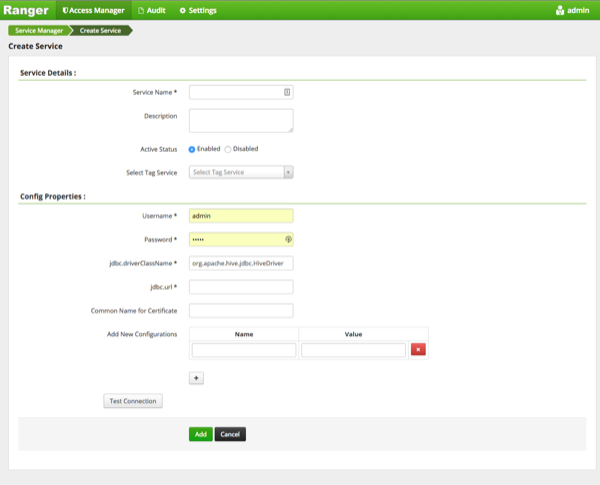 Select Tag Service Select a tag-based service to apply the service and its tag-based policies to Hive. Usually, the Ranger Hive service definition uses the HiveServer2 (HS2) JDBC driver to fetch Hive database/table info for resource lookup and testing the connection. Alternatively, you can configure the service definition to use Hive metastore libraries connecting to the Hive metastore database directly. This is recommended when it is difficult to set up HiveServer2 on your cluster, such as when using HDCloud for AWS. Save and restart required components. 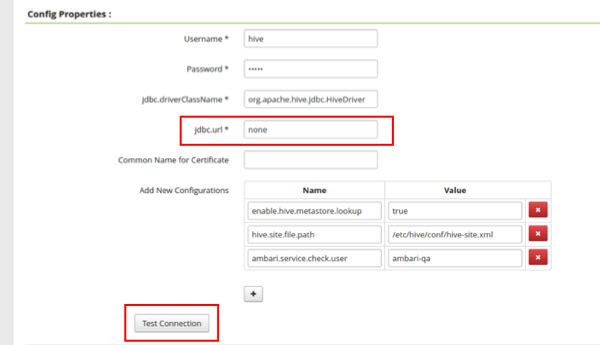 To test the configuration is successful, create a new Hive service and specify the jdbc.url as "none", then run Test Connection.